Better efficiency, starts with better grinding. You’ve already gone through the work to bring the ore to the mill, now it’s time to recover as much precious metal as possible. GrindingExpert™ automatically adjust feed rate, mill speed and water addition to reduce upsets, eliminate grind-outs and increase tonnage in SAG / ball mills. We constantly maintain desired operating conditions by monitoring bearing pressure, power, recycle pebbles, mill density and mill acoustics. On average, expect a 3-6% increase in SAG mill throughput over an operator/DCS system. PlantVision™ visually monitors the feed and relays critical information about the properties of, and changes in, the incoming ore. MillScanner™ will skillfully listen to the mill to ensure it’s safe, reliable, and efficient operation. KSX will tie all of the information together to create optimal set points from which its neural network and genetic algorithms can continuously, learn, predict and further optimize SAG mill throughput. The KnowledgeScape solutions work together to see, listen, and think about the best way to increase tonnage at all times and for all conditions. Our ball mill strategies automatically adjust sump water and mill water addition, mill speed where available and can open and close cyclones when appropriate. The strategy smooths disturbances and provides optimal particle size in cyclone overflow to flotation. Many GrindingExpert™ solutions will include our MillScanner™ Smart Sensor. Using a highly innovative solution that is fixed in rotation with the shell of the SAG mill, MillScanner™ accurately and continuously monitors a mill’s contents to provide invaluable information regarding charge toe and media angles, liner/steel impact detection, and volumetric loading in realtime. MillScanner™ provides information to KSX via OPC communication, and displays radial trends graphically to the control room operator . Combined with traditional process variables such as bearing pressure, mill power, and recycle pebbles, the data provided by MillScanner™ allows the KSX Expert System to make the best possible decisions, in the least amount of time, for all conditions. Because you are taking control actions based on measured media angles, the time delay in system feedback from feed changes is greatly reduced, which helps increase SAG mill throughput. The information that MillScanner™ provides to KSX ensures that the software is able to effectively optimize SAG mill set points and increase efficiency better than any other system. Control strategies can now factor in volumetric loading, charge toe angles, and steel-to-liner impacts in the decision tree along with bearing pressure, recycle pebbles, and mill power. Compromising accuracy when selecting an acoustic sensor for your girding circuit will only compromise the integrity of the control system for future improvements. Control does not have to be what it was 30 years ago, and with KnowledgeScape leading the way in automated process optimization, higher throughput and increased reliability are now possible. Utilizing a MillScanner™ results in better grinding, clear vision of the mill contents at all times, reduced steel and power usage, longer liner life, and significantly increased profits. 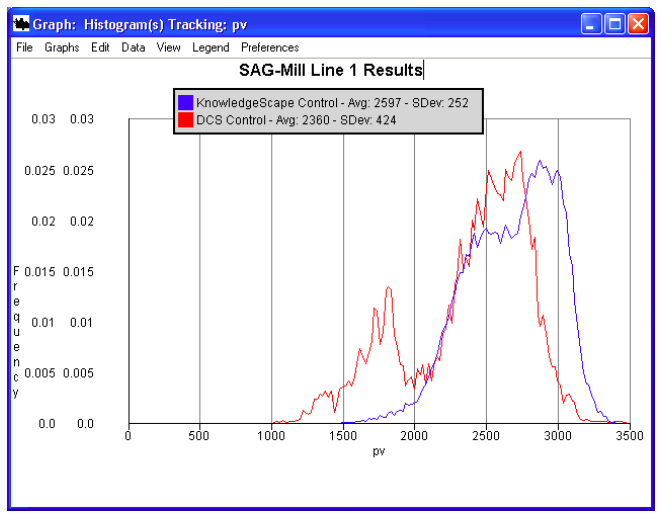 MillScanner is the ultimate tool for increasing SAG mill throughput and reliability. Here are some actual results from Los Pelemres, where GrindingExpert was implemented.